Today, November 25, Park Shin Hye arrived at Haneda airport looking absolutely stunning. From the way she smiled and her energy, you wouldn't think she was up all night hosting the 2011 Melon Music Awards. Leaving home, I met up with a friend and together we went to Tokyo where I bought some Tokyo Bananas for our wonderful Mr. Jun. The train was unusually crowded since it was well past rush hour. But we persisted and on we went to Haneda airport. When we arrived there, we met two other friends that were already there. Seeing that we had about two hours, we went to grab a quick lunch because as we all know, you can't fangirl on an empty stomach! Soon after, we were met up by PSHJP! 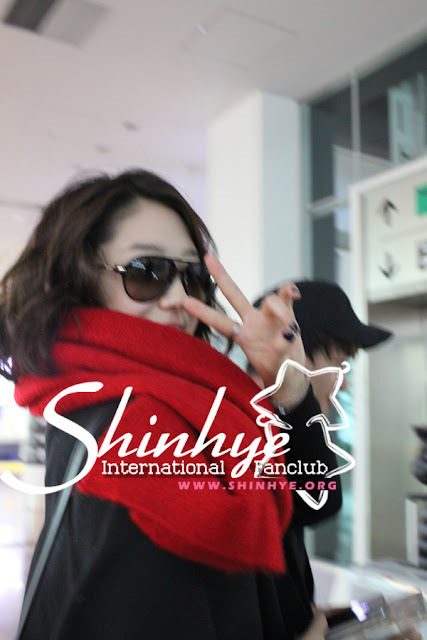 By then we had only an hour before Shin Hye's flight landed so we headed back to the arrival gate. When we got downstairs, there were many people there. Turns out that arriving on the same flight as Shin Hye was Kim Hyun Joon and later, Kang Ji Hwan. We were so happy when his fans were moved to a reserved section leaving the whole gate empty and to ourselves. Hehehe. There we waited and was joined by a young Shin Hye fan. Earlier I handed out pictures PSHIFC took during the ANJELL FM and everyone had a picture of it out waiting for Shin Hye and to ask her for an autograph. Our nerves were haywired and our hearts were pounding nonstop as if we've ran a marathon. It was exciting yet very nerve wracking. The arrival screen said 4:00 arrival time, then 4:05. Soon it was 4:05 and we became very anxious and eager to see her. About 30 minutes after the arrival time, who should we see walked out but Manager Jun Hwan?! He had a trolley with suitcases. He rolled it out and set it to the side. 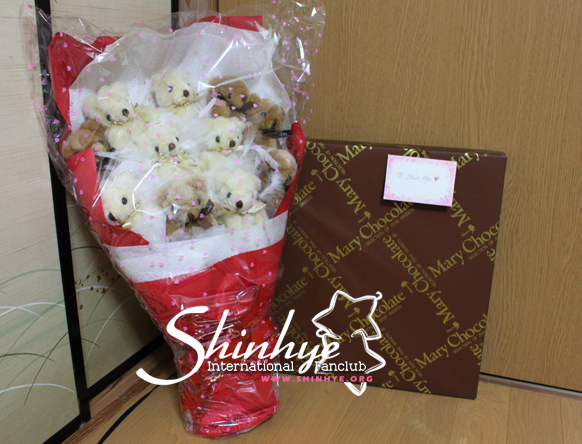 I walked over to Manager Jun and I handed him the HUGE box of Mary Chocolate (trust me, it was huge! My arms are still sore). I told him that it was heavy and the Tokyo Bananas were for him. He said OK! Then he had to go make a very important call. I saw Joa and went to talk to her to see how she was doing. She was all better from the accident this summer. I told her Karen and I went to Korea and we didn't see her and we missed her. Not long after that, Shin Hye walked out. I was distracted for a bit and then I heard the fans and there she really was! walking out of Immigration. Her hair was down and curly; she had her red scarf around her neck and a long wool parka. She looked amazingly beautiful! I couldn't stop saying how beautiful she was!! I hastened (cause that's what I do) toward Shin Hye and handed her the very lovely and cute teddy bear bouquet we've ordered for her! She looked very happy and said thank you and that it was cute. Then she gave me a hug and I hugged her back. I asked her to sign for our site soon after. There were about 10 fans there and everyone got Shin Hye's autograph. 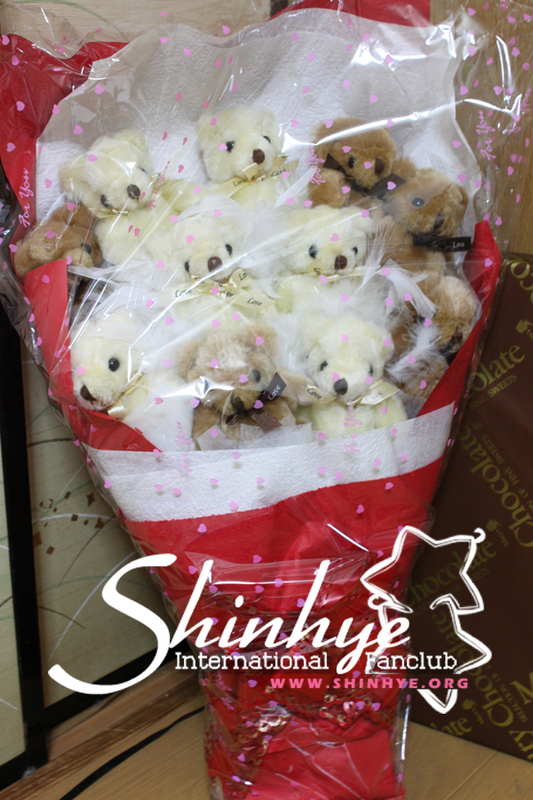 Everyone was very happy and Shin Hye was very happy. She was smiling the whole time. Fans wanted to shake her hand and she shook theirs. Although many crowded around her, no one was pushing or shoveling or hurting Shin Hye. Then we walked toward the elevator and I told Shin Hye that I got a ticket to the concert tomorrow and that I will see her. She said, Oh, and smiled. I asked her for a pose and she smiled and did a peace sign but as we were walking and they needed to go, the picture didn't turn out quite as nice, but it's still beautiful. As she entered the elevator, we waved and said goodbye. She waved and said goodbye too. Then they went down. Shin Hye's young fan was overcome with tears. She was very happy and I was very glad she was able to see Shin Hye in person and get her autograph. Then we walked down to the taxi area and waved goodbye to Shin Hye and shouted we love her. We watched as her van drove away. Everyone was very happy. We were seriously on a happy pill because we couldn't stop smiling at all. It was such a wonderful and happy day. I met many new wonderful people and am glad I was able to share this experience with them. I can't stop saying this, but Shin Hye is so wonderful! She's so beautiful and that beauty shines from inside her heart all the way out. 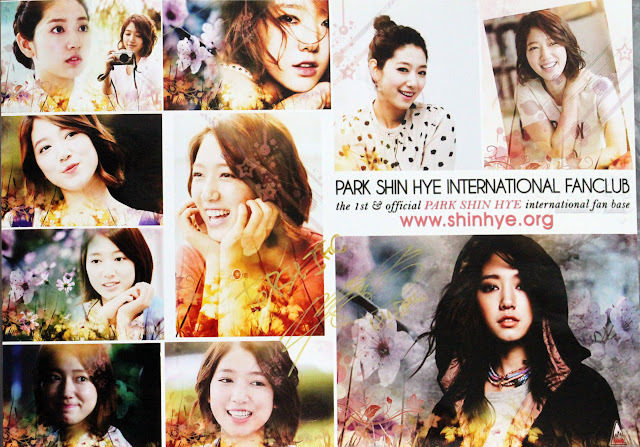 Tomorrow is the JKS' concert and PSH_IFC will be present to represent Shin Hye fans!!!! Can't wait to see what she has in store for all of us!!! Good luck Shin Hye!! We love you so much!!!! 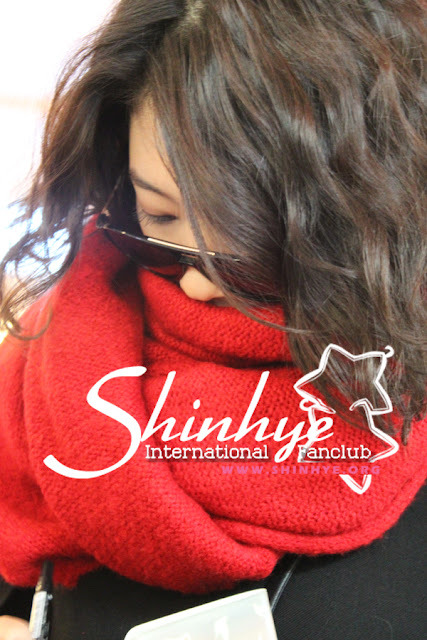 DO NOT TAKE OUT WITHOUT PROPER CREDITS TO PSHIFC/SHINHYE.ORG!!! Please share the event to us tomorrow. Hacci is pretty. OMG Shin hye on the same flight with Kim Hyun Joon and Kang Ji Hwan??? Hope she could get to work with them on a drama. ONLY TEN PEOPLE?!?!!? i thought she would be paraded with fans. i swear if i was there. but sadly thirteen year olds dont have many traveling rights. i wouldve started crying cause it was her and i d tell her how inspirational she is to me. but seriously only ten ppl? i hope they got to have a small talk with her since there was so little. Either they don't know her arrival or they just jealous to her. Because she is so beautiful and special to JKS.